“For no other period or topic have historians been so eager to write and accept history-by-anecdote. Grand analytical generalisations have come from second-hand bits of overheard corridor gossip. Prison camp stories (‘My friend met Bukharin’s wife in a camp and she said …’) have become primary sources on central political decision making. The ‘leading expert’ to whom Getty was referring was, of course, Robert Conquest, whose emotionally-charged books on the Stalin era, such as Harvest of Sorrow and The Great Terror, did more than perhaps any others to ingrain in people’s minds the notion of Stalin as ‘the ruthless dictator’. The fall-out from this speech cannot be underestimated. It led to a rift in the world communist movement between the two largest socialist nations, the People’s Republic of China and the Soviet Union (the ‘Sino-Soviet Split’ as it is referred to by historians), as well as a rift between the Soviet Union and the People’s Republic of Albania. The Albanians and the Chinese rejected both the image of the Stalin era that was being presented by Khrushchev and the way that phoney image was being used as justification for revisions of the central tenants of Marxism Leninism. The anti-revisionist movement was thus born. “Khrushchev’s denunciation of Stalin in the ‘Secret Speech’ echoed Trotsky’s earlier demonisation of Stalin. But in 1956 Trotskyism was a marginal force, its murdered leader most often dismissed as a megalomaniacal failure. Khrushchev’s speech breathed new life into Trotsky’s all-but-dead caricature of Stalin. Trotskyism thus re-emerged as a force within the working-class movement and, often trading off its apparently sharp-eyed analysis of the Soviet Union, rose to become one of the most persistent features of the western political spectrum. Indeed, in a very real sense it may be said that the ‘Secret Speech’ was the birth of modern Marxism. After all, what modern strand of Marxism has not been shaped by its views on the Stalin era? ‘Western Marxism’ (the Frankfurt School, Hegelian Marxism etc) sought to develop a ‘non-totalitarian’ Marxism and much of its work is pregnant with ruminations about ‘terror’; and the necessity for the ‘freedom of the individual’ to safeguard against it. ‘Luxemburgism’ and ‘Anarchism’, which came to believe that the Leninist political project itself inevitably ended in tyranny and repression. And, of course, ‘Trotskyism’ which we have already touched upon. The book has already caused a storm in Russian academic circles and is beginning to make an impact in the United States, as well. As Professor Roger Keeran of Empire State College has remarked: “Grover Furr’s study demands a complete rethinking of Soviet history, socialist history, indeed world history of the 20th century.” This is not an overstatement. – Stalin supported and fostered a ‘cult of personality’. Furr demonstrates that not only did Stalin not actively foster any such ‘cult’, he spent a great deal of his time actively fighting against it. Khrushchev, on the other hand, emerges as one of the leading proponents of the cult, for his own self-serving political motives. – Stalin embarked on ‘mass repressions’ within the Bolshevik party. This claim has already been tackled by earlier historians and writers (including Ludo Martens, in his book Another View of Stalin), but it is Furr who really puts it to bed, with reams and reams of primary sources to refute it. Furr also successfully rehabilitates Lavrenti Beria, the man who is often accused of being ‘Stalin’s executioner’ in his role as head of the NKVD. – Stalin stifled internal party debate and ruled the Soviet Union as a ‘dictator’. Furr provides an impressive collection of primary sources, which document that Stalin was committed to internal party democracy and that he made no special fetish of his position of power. In total, Furr identifies and debunks sixty individual lies or half-truths put forward by Khrushchev in his ‘Secret Speech’. The sheer number of major modifications to our common understanding of the Stalin era that are suggested by Furr is dizzying. The beauty of Furr’s book, however, lies in the clarity of its argument and the author’s rigorous attention to good historiography. Every claim that Furr makes is backed up with primary or secondary sources of real weight. “Yes, it seems that until the 11th Congress we did not have this position [of General Secretary]. That was before Lenin stopped working. If Lenin concluded that it was necessary to put forward the question of founding the position of General Secretary, then I assume he was prompted by the special circumstances that appeared with us before the 10th Congress, when a more or less strong, well-organised opposition within the party was founded. These are just two examples from what is a veritable goldmine of source material. “The fact that a defendant was tortured does not mean that defendant was innocent. It is not evidence that the defendant was innocent. But it is often erroneously assumed to be … Establishing the fact that someone really has been tortured is not always easy. “The mere fact that someone claims he confessed because he was tortured is hardly foolproof. There are many reasons why people sometimes want to retract a confession of guilt. Claiming one was tortured is a way of doing this while preserving some dignity. So to be certain a person was tortured there has to be further evidence of the fact, such as a statement or confession by a person who actually did the torturing, or a first-hand witness. Another engaging aspect of Furr’s work is the possible conclusion that it points towards, and it is this aspect that will probably most interest those readers who are already convinced of the ‘innocence’ of Stalin. Traditionally, it has been assumed by anti-revisionists that Khrushchev’s primary motivation in attacking Stalin was to lay the groundwork for his pro-market economic reforms and his counter-revolutionary modifications to Marxism Leninism. Furr accepts this as a likely primary motivation, but he adds to this another, more disturbing, possible motivation. Furr returns to the right-Bukharinite conspiracy that was uncovered by the Moscow Trials in the late 1930s and notes the sheer number of those convicted as part of that conspiracy by Stalin and Beria who were ‘rehabilitated’ (often posthumously) by Khrushchev following his ‘Secret Speech’. “[Iuri] Zhukov has argued that it was the First Secretaries, led by Robert Eikhe, who seem to have initiated the mass repressions [uncovered and exposed by Beria and Stalin in the late 1930s]. Khrushchev, one of these powerful First Secretaries, was himself very heavily involved in large-scale repression, including the execution of thousands of people. “Many of these First Secretaries were themselves later tried and executed. Some of them, like Kabakov, were accused of being part of a conspiracy. Others, like Postyshev, were accused, at least initially, of mass, unwarranted repression of party members. Eikhe also seems to fall into this group. Later many of these men were also charged with being part of various conspiracies themselves. Khrushchev was one of the few First Secretaries during the years 1937-1938 not only to escape such charges, but to have been promoted. The implications of such a possibility are, of course, massive. In particular, if Khrushchev could be proven to be a part of the right-Bukharinite conspiracy, it would have vital implications for our understanding of the birth of revisionism in the Soviet Union. The difficulty for anti-revisionists up till this point has been to demonstrate how seemingly good communists could develop into enemies of the proletariat. This new theory, while not removing the difficulty entirely, would certainly tie it into more readily explicable phenomena, such as the right deviation that overtook Bukharin and others and led them to actively seek the overthrow of the Soviet leadership. Clearly, this is a point that will demand further examination. If there is one major fault to be found in Furr’s work, it is his final conclusion. In the very last page and a half of the book he arrives at the somewhat dubious assertion that the rise of Khrushchevite revisionism and the right-Bukharinite conspiracy is to be explained by the faulty conception of socialism which Stalin inherited from Lenin and Lenin in turn interpreted out of the works of Marx and Engels. This is not a conclusion which he has hitherto been building towards, nor is it one that he makes much, if any, sustained attempt to support in the page and a half that he discusses it. It feels a-priori, as if the author is trying to make his own personal belief about Marxism Leninism sit comfortably with the other conclusions of his research in a way that it simply does not. To Furr’s credit, he wisely ends on the words “that is a subject for further research and a different book”, but nonetheless, one is left wishing he had simply left his own personal feelings on Marxism Leninism for that ‘different book’ and not tacked them, sloppily, to the end of what is otherwise a fantastic work. 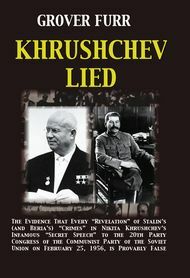 Khrushchev Lied is a fascinating new perspective on the history of the Stalin era. The wealth of new research alone is worth the cover price, but the reader is also treated to an excellent discussion of historiography and some tantilising possible conclusions. I would urge anyone with any interest whatsoever in either Joseph Stalin or the Soviet Union to read it, but also I feel certain that it will serve as a new vital resource for the anti-revisionist movement in its fight against the historical distortions perpetuated by the enemies of Leninism. The sickest joke to come out of Stop the War’s reactionary stance on Libya has been the accusation that members of StW who stand in solidarity with the Gaddafi-led Libyan revolution are a divisive influence within the anti-war movement and should pipe down at public meetings, reserving their distasteful minority opinions for under-the-counter retail (or preferably shut up all together). Yet what has truly divided and weakened the anti-war movement, indexed by the dwindling of national anti-war demonstrations from millions to hundreds, has been the perennial reluctance of the leadership to consistently call for victory to the Afghan and Iraqi resistance, a stance that has finally degenerated into John Rees’s open support for the imperialist-backed Benghazi rebellion. Rees and co have since scrambled back to a stance that they hope will rescue their ‘progressive’ reputations (basically ‘stop bombing Libya, you’ll only make it harder to get rid of Gaddafi’), a clumsy and hypocritical manoeuvre which will fool few and inspire none. It is this misleadership, and StW’s resulting failure to give an anti-imperialist lead as capitalist crisis breeds fresh wars, which undermines and weakens the movement. We are constantly told that our anti-imperialist stance risks alienating some supporters of StW’s (somewhat narrow) broad front. It is not impossible that some overly sensitive petty-bourgeois liberals might find the atmosphere uncongenial in an anti-war movement which had learned to outgrow its social-democratic prejudices, however many times it was spelt out to such individuals that their presence within the broad movement remained welcome. But right now, we need to understand why the ‘broad’ front in reality remains so very narrow; how it is that the mass of working people do not actively embrace the cause of peace and withdraw their cooperation with imperialism’s wars. What is it about StW’s approach that so severely limits its scope? The fact is that, so long as those leading the anti-war movement refuse to give solidarity to the forces that are resisting imperialist aggression on the ground, they will be keeping British workers divided from their real allies in the fight against monopoly capitalism and its wars, hindering them in the indivisible struggle for socialism and peace. As Karl Marx wrote, no nation that enslaves another can itself be free. The failure to give consistent and wholehearted support to those defending Libya’s sovereignty with arms in hand can only weaken and divide the anti-war movement. It is not the CPGB-ML and fellow internationalists who pose a threat to the unity and progress of the anti-war movement, but the rotten Trotskyite and revisionist politics that infect the upper echelons of StW and wash back into its branches, rendering the movement vulnerable to being shoved off course by every new wave of imperialist propaganda. Whilst we have never taken a sectarian approach in our work with StW, cultivating good personal relations with fellow coalitionists from all backgrounds, we cannot shirk the responsibility of identifying the destructive and divisive influence of those political agendas behind which some remain trapped. Particularly damaging is the Trotskyite combination of deep historical pessimism (‘the Soviet Union was a disaster; the working class has nowhere taken and held power and gone on to build socialism’) with the most light-minded optimism over the probability of finding some ‘progressive’ needle in the stinking reactionary Benghazi haystack, some (as yet undocumented) perfect Trotskyite strand within the (very well-documented) hotch-potch of monarchists, veteran opponents of the revolution, paid assassins and mercenaries. Whilst one might think that their own historical pessimism should instil in them a degree of caution, the reverse is the case. In fact, the phony optimism is about as healthy as the hectic flush on the face of a fever patient, and serves one purpose alone: to make it easier to abdicate political responsibility. Why endure the unpopularity of standing by the Gaddafi revolution when you can have your cake and eat it, standing shoulder to shoulder with the BBC cheering on the rebels, whilst simultaneously posturing as ‘anti-imperialists’? With the same glad heart, the same gentry lined up with Thatcher to cheer on Solidarnosc (or ‘progressive elements’ supposedly lurking within that anti-communist lynch mob) against the Polish workers’ state, helping prepare the ground for the subsequent liquidation of socialism. ‘Neither Washington nor Moscow’ was their mantra then, ‘Neither Gaddafi nor Nato’ is their mantra now. Will we wake next week or next month to ‘Neither Damascus nor Nato’, ‘Neither Teheran nor Nato’ or ‘Neither Pyongyang nor Nato’? What about ‘Neither Beijing nor Nato’? The anti-war movement faces stormy times ahead, where the warmongering scenarios will be getting ever messier and more complex and the choices to be made ever more knotty. (By comparison, Libya should have been a no brainer.) The movement’s ability to weather these storms will increasingly depend upon its ability to grow up politically and develop a consistent anti-imperialist perspective. We in the CPGB-ML stand ready to assist in this endeavour.